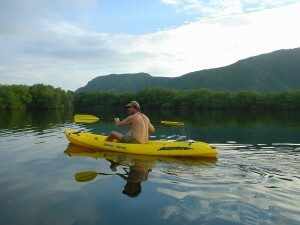 The Coral Lagoon of La Cienaga is the ideal place to play with kayaks all year round due to its sheltered location and its many places to explore. All our services at the Coral Lagoon Lodge include the use of sit on top tandem kayaks and your host Oskar, will provide you with all the gear and instructions for you to have a safe and fun time! 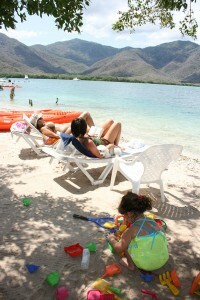 The Coral Lagoon of la Cienaga offers some of the best Venezuela snorkeling sites. The coral lagoon’s fringe reefs and its bordering mangroves teem with parrot fish, angel fish, trumpet fish, lobsters, squid, sea horses and octopus amongst many others, not to mention many types of hard and particularly soft corals. At the Coral Lagoon Lodge Oskar will provide you with all the snorkelling gear and instructions you need to explore this unique coastal habitat. 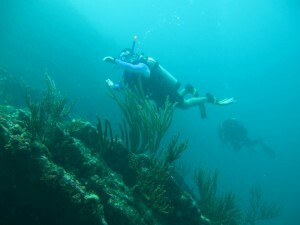 The steep coastline of the Henri Pittier National Park offers some of the great Venezuela diving sites. Whether you are an experienced diver looking for new challenges or a total beginner interested in a full diving course or an instructor assisted discovery dive, we offer a professional scuba diving service with multilingual guides. Just a small distance from the Coral Lagoon lodge there are many unique diving sites where the accented coastline hides underwater grottos and canyons to explore. A ten minute boat ride away you can dive two locally renowned wrecks, the ‘Carmen Fabiana’, an impressive 10,000 ton freighter laying at 30 meters; and the ‘Gran Roque’, a tug boat lying at 18 meters. Both of these wrecks were purposely sunk by our friend, neighbor and scuba diving instructor Cesar Navas several years ago and now are teeming with marine life ! 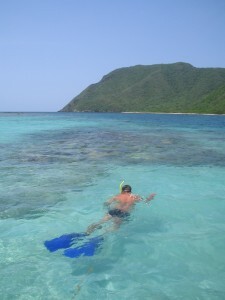 You can also take a shore dive straight from the Coral Lagoon lodge lodge or take the dingy to many other great Venezuela diving sites found just close by. Fishing is fun for all, big and small! From your deck chair in front of the Coral Lagoon lodge with your morning coffee or your evening’s wine a great time can be had fishing ! From beginners to pro’s we offer all the equipment and instructions for the enjoyment of this activity. For the enjoyment of the little ones we have fish tanks where their catch can be placed for educational observation. Snappers, groupers and even lobsters bite! The little ones are returned to give them a chance to grow and the big ones pass through Oskar’s fires before ending up on your plate! 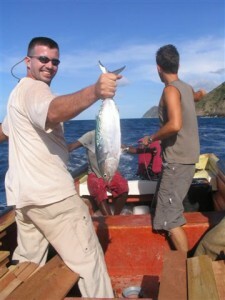 For more serious fishermen wishing to go trawling for bigger trophies such as tuna and dorado or for fly fishermen hunting for tarpon in the mangrove we will arrange outings with our local fisherman friends! For nature lovers there are trails you can explore on foot that venture into totally virgin tropical forest and mangrove swamps. 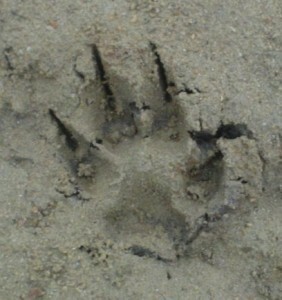 Here it is possible to see puma and jaguar tracks, deer, snakes, scarlet ibis, ospreys, wild pigs, capuchin and howler monkeys just to mention a few! There is also sulphur mud pool where caking yourself with the black mud is said to restore several years of your youth! Be it relaxing on our deck chairs or snoozing in our hammocks under the mangrove trees there is no better place than the Coral Lagoon Lodge to get away from it all. For families with little ones these two strategic positions are ideal for observing the kids while they splash on the shore, make sand castles and explore the coastal marine life! With no mobile reception and no interruptions to your well deserved rest – we hear it from our guests over and over again – this is it!